A special free exhibit inside Grand Central Terminal is now open to the public for the next two weeks! Presented by the Municipal Art Society of New York (MAS), the Museum of the City of New York, the New York Transit Museum, and MTA Metro-North Railroad, the exhibit honors the 40th anniversary of the Supreme Court decision that affirmed Grand Central Terminal’s landmark status and the 20th anniversary of the restoration of the space. Please stop by Vanderbilt Hall before October 5 to learn more about the decade-long fight led by MAS that saved Grand Central Terminal from destruction. And remember, MAS also offers the official guided tour of Grand Central, departing daily at 12:30 PM from the Terminal’s Main Concourse. The 75-minute tour is led by MAS-trained docents and highlights the history, architecture, and operations of one of the world’s biggest train terminals. Tickets are required for the guided tour, but not the Vanderbilt Hall exhibit. To stay informed on the latest news and events at Grand Central, subscribe to Grand Central Terminal’s weekly newsletter. 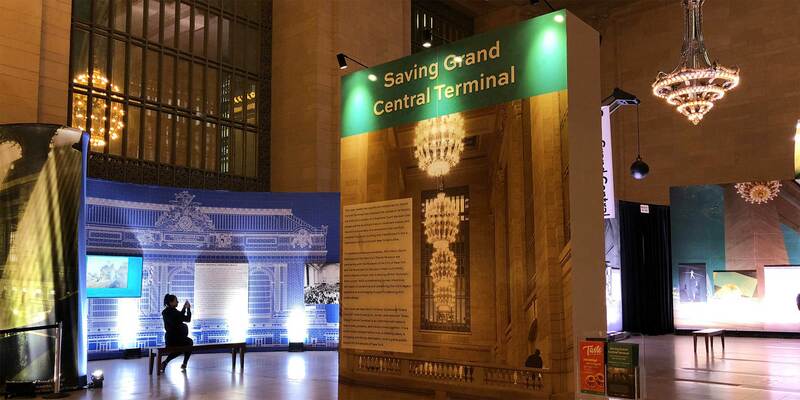 The Saving Grand Central exhibit in Grand Central Terminal's Vanderbilt Hall. Photo: Grand Central Terminal. Forty years ago, MAS celebrated as the United States Supreme Court affirmed the constitutionality of the Landmarks Law in the Penn Central Transportation Co. v. New York City case. It was a hard-won victory that involved a decade of legal advocacy, political pressure, and public engagement by a small band of committed advocates who refused to stand by while Grand Central met the same fate as Original Penn Station. This decision not only saved Grand Central Terminal from destruction, but also ushered in a new era of historic preservation in America—today, more than 500 municipalities across all 50 states have passed preservation laws modeled after New York City’s. And it set the stage for the renovation that carefully restored the iconic building and transformed it into a destination for tourists and New Yorkers alike.